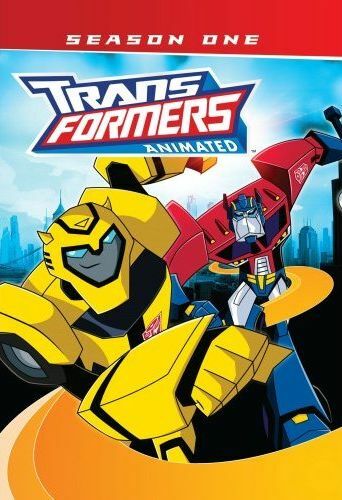 The first season of Transformers Animated finally arrives on DVD, and is a good followup to the Transformers Animated - Transform and Roll Out movie. The first season picks up right after the events of that movie (which was later split into three episode so it could be broadcast along with season 1 episodes, and is often considered to be the first three episodes of season 1), and finds the Autobots on Earth helping to defend the city of Detroit from various sources of evil. The first episode gives us our first human supervillain, The Angry Archer, who dresses up like a Robin Hood reject and has impossible skills with a bow and arrow. And he won't be the only human supervillain to cross paths with our robotic heroes and their human pal, Sari. Overall, I think this is a nice change from the original Transformers series, where just about every conflict was between Autobots and Decepticons. With this series, they've thrown in a lot of different possibilities for stories besides Decepticons, such as human villains, rogue machinery, unaffiliated Transformers, and even nature itself. What's more is that, although most episodes can be watched as standalone episodes, there is a plot thread that runs through the entire season involving the infamous Decepticon leader, Megatron. Presumed dead at the end of the movie, we soon learn that his head was not decimated like his body, and is accidentally brought back to life by the all spark power held in Sari's key. I don't want to give away too much, so I'll just say that the Megatron in this series seems a lot more devious, intelligent, and just overall evil than the Megatron of the original series. He truly feels like a dominating leader, even as just a disembodied head stuck in a room. And I don't think it's really a spoiler to say that Megatron eventually will get a body, and it is pretty cool looking, taking elements of the original Megatron like many of the Transformers in this series that have elements reminiscent of their generation one counterparts. But no, he does not transform into a handgun. Several episodes in this season introduce Transformers that are recognizable from previous series, such as the Dinobots, Constructicons, Soundwave, Wreck-Gar, Black Arachnia, Arcee, and even Headmasters. Some work, but some don't. Soundwave used to be one of my favorite characters, but I thought the new Soundwave they introduced here was just really lame. I mean, a toy music machine built by Megatron and Sari's father that comes to life thanks to her key... that could work, except it really didn't do anything for most of the series except play this awful music that Sari seemed to really like, and his evolution from her constantly using the key on him seems to only be that he gets bigger. This isn't the badass Soundwave I remember. And the Constructicons, who used to be five construction vehicle robots that could transform and merge into one giant destructive robot named Devastator, are now two robots who don't seem to care about anything except drinking barrels of oil. So those were disappointing, but some of the others, like Wreck-Gar, Black Arachnia, and the Dinobots turned out to be pretty good characters. The Dinobots even come back in a later episode, and then again in season two along with Black Arachnia. Hopefully they'll bring Wreck-Gar back in season three. The human villains are all kind of silly, more like something you'd find in the Teen Titans cartoon, or even Darkwing Duck. I already mentioned The Angry Archer, then there's also Nanosec who can move extremely fast thanks to a speed suit designed by Dr. Sumdac. There's also Meltdown, who turned into some kind of acid guy that can melt metal, and Professor Princess who is just a little girl that rides on a toy horse. And finally, Headmaster, who developed this dumb-looking exosuit that removes a robots head and transforms into a head to replace the head that it just removed. Out of all of them, I think he is probably the most lame. The original headmasters were pretty lame as well, and never took off that well (at least here in America), so it's kind of amazing that they were able to come up with something even stupider. This series is pretty good, and even if it doesn't quite live up to Transformers Animated - Transform and Roll Out movie, it is still worth watching. The uniqueness and personalities of all the characters help to draw you in to their universe and have the series stand out from other shows, plus all of the nods to previous series incarnations are fun to see, even if some don't work out too well. Unfortunately, there's virutally no special features to speak of other than a photo gallery (does anyone ever look at those things?)... which is disappointed. I would have loved a look behind the scenes, or a commentary on the production, as it's obvious that the people who work on this show are true Transformer fans.